Quality Meat Scotland has launched a campaign to encourage livestock farmers and others in the Scottish red meat industry to improve their understanding of assurance status. Posters explaining the three key categories of assurance – Scotch Assured (SA), Farm Assured (FA) and Non-Assured (NA) – will be displayed in auction markets and abattoir lairages around the country during the coming weeks. “Our industry’s pioneering assurance schemes underpin the Scotch Beef, Scotch Lamb and Specially Selected Pork labels and are among the best in world,” said Jim McLaren, chairman of Quality Meat Scotland. “As well as farms, the assurance schemes cover the feed, auction markets, transport and processing sectors and ensure a life-long, high standard of livestock husbandry, welfare and animal health. The posters clearly spell out what each of these definitions means. To be “Scotch Assured” and carry the “Scotch” brand animals must be born, reared and slaughtered in Scotland and have been QMS Farm Assured throughout their lives. 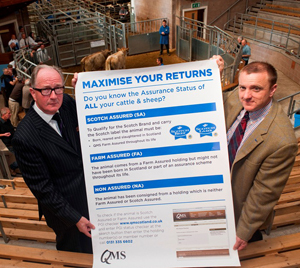 QMS Chairman, Jim McLaren, delivered one of the first posters to be displayed in the new campaign to United Auctions’ Stirling mart. David Leggat, Executive Chairman of United Auctions, is pictured receiving the poster aimed at driving greater understanding of the assurance categories. ‘Farm Assured’ refers to animals which come from a Farm Assured holding but might not have been born in Scotland or part of an assurance scheme throughout their lives. Finally, “Non-Assured” animals have been consigned from a holding which is neither Farm Assured nor Scotch Assured. The posters also give information on a PGI status checker tool on the QMS website www.qmscotland.co.uk which allows people to check the assurance status of farms on-line.